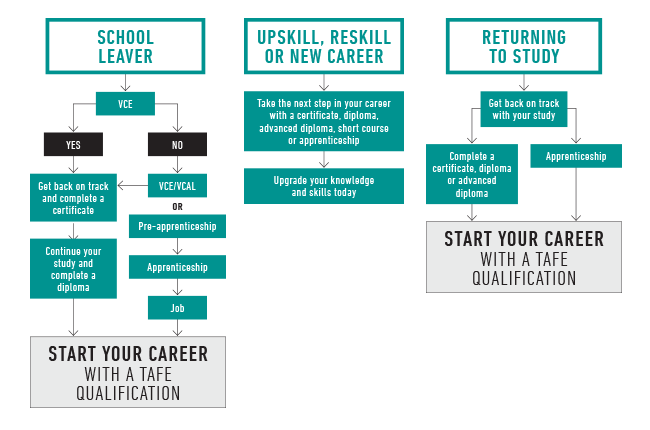 Bendigo TAFE’s range of course options and pathways can help you get into your dream career. Our focus is on giving you hands-on skills from industry experts and real work experience so you can be confident and work ready to achieve your goals. Enjoy a supportive environment with small classes and individual attention. A pathway is the sequence of studies you select to reach the qualification and career of your choice. Often, you can reach the same outcome via different pathway options. Identifying a few options is helpful in case circumstances prevent you from completing the initial pathway you had in mind. There are often many ways to achieve the career of your choice including formal and informal learning, employment and general life experience. Different courses can take you towards the same job or courses can act as a stepping stone towards your career goals. Donna, a mother of two, returned to study after 22 years in the hospitality industry. Donna entered straight into her second year of her Bachelor of Nursing, through a pa​rtnership with Bendigo TAFE and La Trobe University​. What pathways can I take? Bendigo TAFE has partnered with a number of schools across the region to deliver VETiS (Vocational Education and Training in Schools) and VCAL (Victorian Certificate of Applied Learning) programs. These programs are an alternative pathway through senior secondary school. Students undertake industry-focused training as well as studying the traditional school curriculum. The programs give students in years 10, 11 and 12 a head start on TAFE training, apprenticeships or employment once they complete secondary school. See our pathways​ and courses for details and check out our student stories to hear from those who have gone further in their TAFE study. One of the key pathways that people can take from a TAFE course is the one to university. Many TAFE qualifications, such as advanced diploma, diploma and some certificate IV qualifications, provide credits towards a university undergraduate course. This means that you can gain credits towards completion of your chosen undergraduate course without studying similar units.